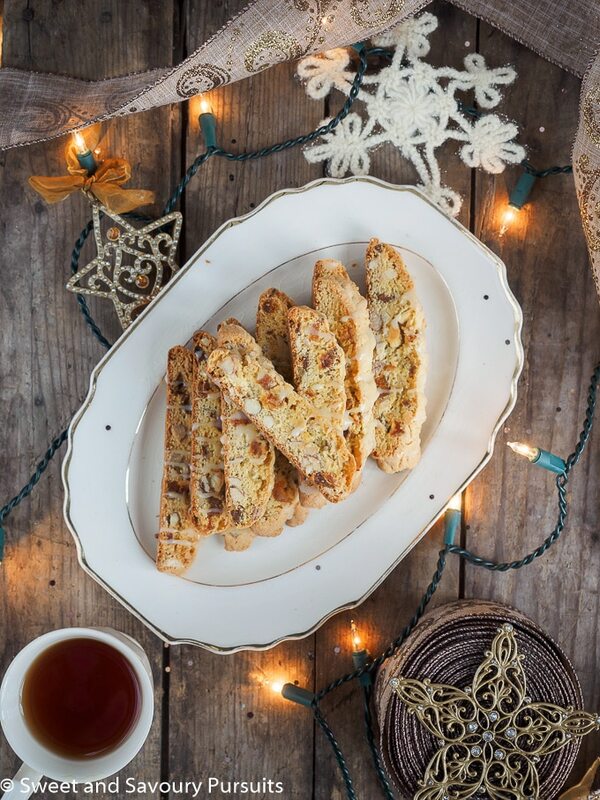 This delicious Apricot and Almond Biscotti with White Chocolate Drizzle has just the right amount of crunchiness and a perfect balance between fruit and nut. The holiday season is upon us and I just can’t believe that it’s that time of year again, how is it possible for a full year to pass by so quickly? It seems like it was just a short while ago that I was taking the Christmas tree down. And now here I am getting all of the Christmas decorations out again. Anyways, I do love it and the kids are always so excited and happy to help decorate the tree. But my favourite part of the holidays is all the baking I get to do, I love to plan all the cookies and bars that I’m going to make for my annual dessert tray. I always have some sweets that are a must every year, such as my mother’s Baklava, Pecan and Lime Sugar Cookies and these Hazelnut and Almond Crescents. Biscotti is also a must, though with all the variations possible I like to change it up a bit every year. Last year, I made these amazing Pistachio and Cranberry Biscotti, honestly the best biscotti I had ever made or tasted, I received so many compliments on them. So I knew that for this year I would have to include an equally delicious biscotti on my platter. I decided that I would stick to a recipe that I knew would be delicious but to make the biscotti a bit different from the ones I made last year, I changed the fruit and nut to dried apricots and toasted almonds instead of cranberries and pistachios. I also added a bit of almond extract which I just love and finished them off with a white chocolate drizzle. The biscotti taste wonderful, with just the right amount of crunchiness and a perfect balance between fruit and nut. 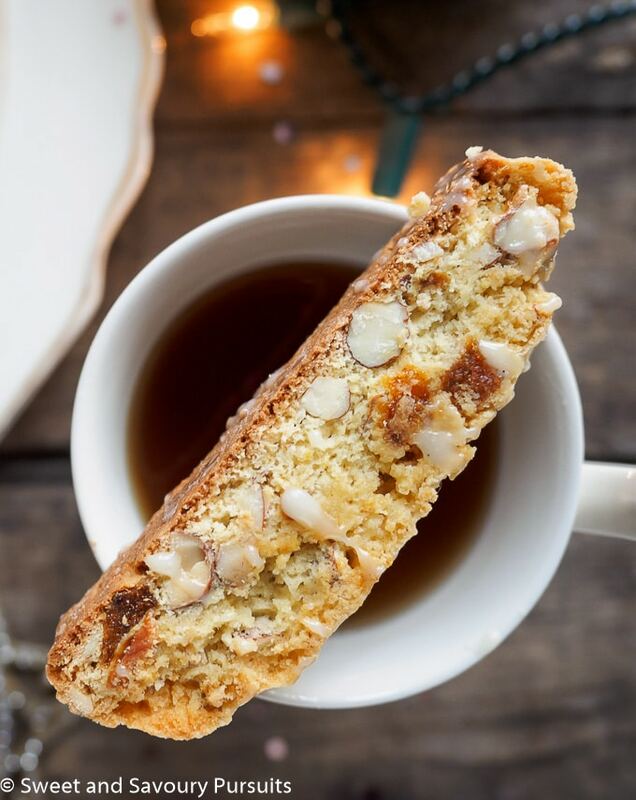 The white chocolate drizzle makes them a little more special but is completely optional as this biscotti is delicious with or without it. Enjoy! Line one baking sheet with parchment paper and set aside. Remove enough zest from one large orange to make 1 tsp. set aside. Squeeze the orange to obtain 2 teaspoons of orange juice. In a microwaveable bowl, combine the chopped apricots with the orange juice and microwave for about 40 seconds. Set aside. In a medium bowl, whisk together the flour, 1/2 cup of sugar, baking powder and salt. Set aside. In the bowl of your stand mixer (fitted with the paddle attachment), beat the butter and orange zest with the remaining 1/2 cup of sugar for about 2-3 minutes on medium speed until butter is fluffy. Add the vanilla and almond extracts, beat to incorporate. Add the eggs, one at a time beating after each addition. Reduce mixer speed to low and add the flour, baking powder and salt beating until combined. Add the apricots and almonds and mix until the ingredients are incorporated into the batter, do not over beat. Turn the dough out onto a lightly floured surface and using your hands shape each dough into a log. Pat the dough so it’s about two inches wide. Place logs onto lined baking sheet, spacing them 3 inches apart. Bake for 12 minutes, rotate the tray and bake for another 11 to 12 minutes or until logs are light golden brown and beginning to crack on top. 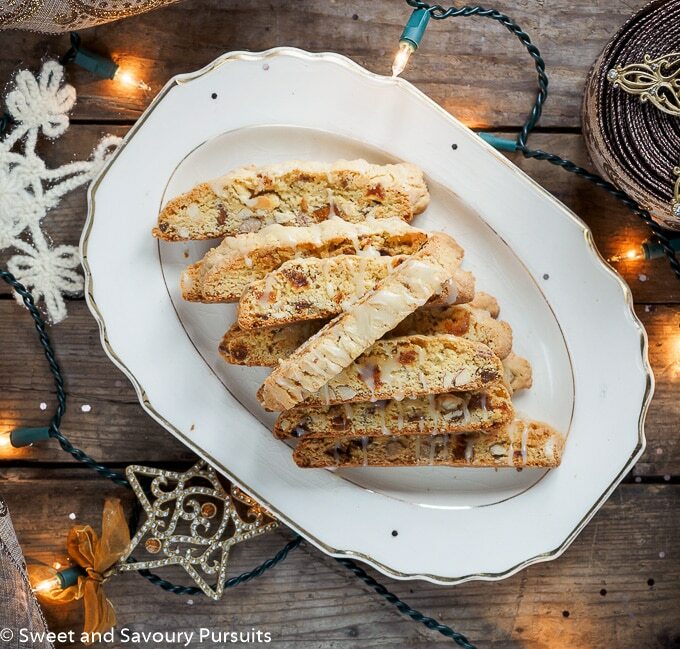 Place one biscotti log at a time onto a cutting board and using a sharp serrated knife, slice the logs on a diagonal into ½ to ¾-inch-thick slices. Combine the chopped white chocolate and cream in a small microwaveable dish. Microwave at 50% intensity in short bursts of time (about 20 seconds), stirring between each time until the chocolate has melted completely. Let cool a couple of minutes and using a fork drizzle the white chocolate on top of the cooled Biscotti. Those biscotti look amazing! Great photos too! 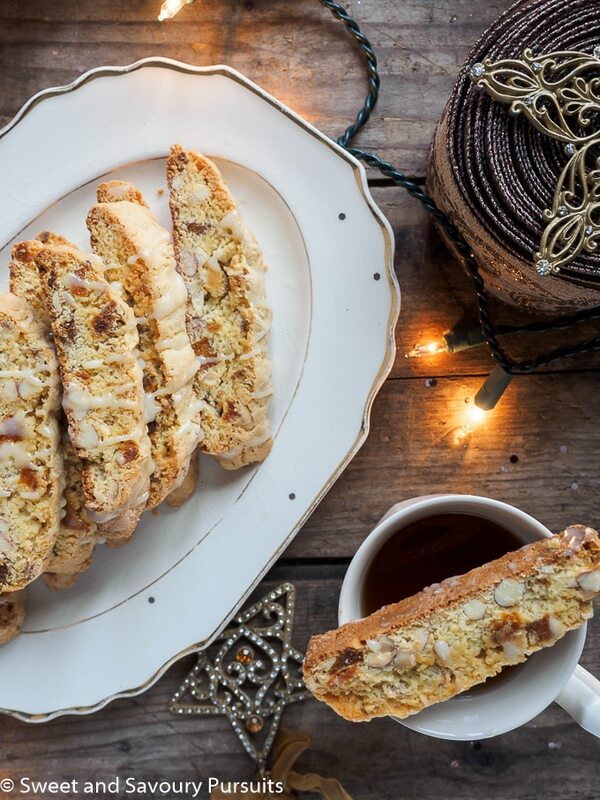 Biscotti is one of my very favorite holiday treats. I could just sit there all morning dipping biscotti into my coffee. Thanks for this fabulous recipe! PS – love the festive photos! I am going to use your recipe and mix up the add in’s playing around with different combinations. Your biscotti are just perfect looking. Thank you! So many variations possible. I’d love to know what add in’s you end up using and how they turn out. Do keep me posted! Oh my goodness, these look so good, I tried and loved the pistachio and cranberry biscotti on your blog, so I can’t wait to try this one. Oh thank you so much, I’m sure you’ll love it! Gorgeous photos, Fida. They really put me in the holiday mood. The biscotti looks delicious! Thanks so much Louise, had lots of fun styling this one!